Nat (short for Nathaniel) Lofthouse was a classic English centre-forward who nearly averaged a goal a game during an eight year stint as England’s No 9. Scoring thirty goals in thirty-three matches for England he also scored 255 goals in 452 appearances for Bolton Wanderers, the only club he played for. 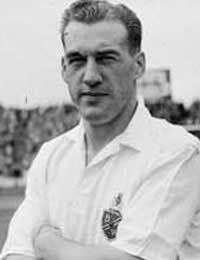 Lofthouse signed for Bolton just before the war broke out but had to wait until after the war for his League debut (although games were played during the war, the League itself was suspended), scoring twice in a 4-3 defeat by Chelsea in 1946. His England debut did not come until 1950, despite popular support for him to be selected well before then, and he proved the doubters wrong by scoring both goals in a 2-2 draw against Yugoslavia. In 1953 he was named the English Player of the Year, and scored in every round of the FA Cup tournament, one of only twelve players to have done so. Unfortunately, although he scored in the final, Bolton went down 4-2 in the classic ‘Matthews Final’, but Lofthouse had the consolation of ending the season as the top scorer, with thirty goals. His most memorable performance for England was during a match in Vienna, against the Austrian national side, in 1952. He had opened the scoring with a driven left-footed volley but was then badly hurt on two occasions by some tough ‘tackles’ from the Austrian defence. But the no-nonsense striker played on and in the 82nd minute, with the score at 2-2, he got the ball near the halfway line and galloped all the way to score the winner, colliding with the keeper as he released the shot. Lofthouse was unconscious by the time the ball rolled over the line and was unaware that he’d scored the winner. After five minutes off the pitch he returned for the end of the game. Three days later he dusted himself down and scored two goals in a 3-0 defeat of Switzerland. Lofthouse was in the squad for the 1954 World Cup tournament in Switzerland, England having won the Home Championship in 1953, which served as a qualifying group. Lofthouse scored 2 goals in a thrilling 4-4 draw with Belgium, the first a spectacular diving header from a Tom Finney cross. Lofthouse missed the next match, a win against Switzerland, but was back in the side, and scoring again, getting one of England’s two goals lead against Uruguay. But Gil Merrick, the England keeper, was having a nightmare and, in what proved to be his last match for England, let in two soft goals, then at the end allowed another speculative shot in, and England were out at the quarter-final stage, losing 4-2. In 1956 Lofthouse scored two goals in a 5-1 win against Finland in Helsinki. This took his total of England goals to twenty-nine, one more than the previous record holder, the great Steve Bloomer. The record had stood since before the First World War, but Lofthouse’s scoring was about to be put on hold. Despite playing well and scoring consistently (so many England matches contained a pair of Lofthouse goals rather than just one), Lofthouse was then left out of the side for more than two years. Lofthouse’s spell in the international wilderness unfortunately encompassed the 1958 World Cup in Sweden. The public were bewildered by some bizarre team selections as not only was Lofthouse left out, but also Stanley Matthews, Jimmy Greaves and Brian Clough, and this with the selectors picking 20 players rather than a full squad of 22. This was compounded by the death of at least three key England team members in the Munich air disaster and a weakened team returned home at the end of the group stage. After the World Cup Lofthouse was recalled for a friendly against the USSR, a re-match of the World Cup group play-off match which England had lost 1-0. Scant consolation was provided by a 5-0 drubbing, with Lofthouse scoring one with a left-foot piledriver, completely disregarding the Russian defender who was hauling him back by his shirt, and Johnny Haynes scoring his only international hat-trick. Lofthouse’s goal took him to a total of thirty for England, equalling the record that Tom Finney had only just set, scoring against Northern Ireland two weeks before. The other goal was scored by a youngster making a big impression with his sixth goal in his fifth England game, a certain Bobby Charlton. It is disappointing that Lofthouse’s England debut was delayed as he was 25 by the time he made his debut and had to retire at the age of 33, with an ankle injury. As a result he only obtained 33 caps and 30 goals, and it could have been many more had he not had those two seasons out of favour. Playing for Bolton Wanderers throughout his career he has been honoured with the office of life president and has one of the stands at the Reebok Stadium named after him.